As I am writing this posts and looking at the photos, I can't help but to wonder where the sun is? I have been waiting all winter for the weather to be actually cold and rainy, but now that it is I wish it isn't, at least not for another week! I have so many Valentine's Day looks I need to shoot still! Oh weather... always bad timing. Anyways, back to today's outfit. Prints are always fun but plain solid pieces can be interesting too. I am wearing a black turtleneck sweater layered with a burgundy leather jacket, royal blue flounce skirt, strappy heeled booties, and lastly an incredible cow hide clutch by Primecut to tie the whole look together. 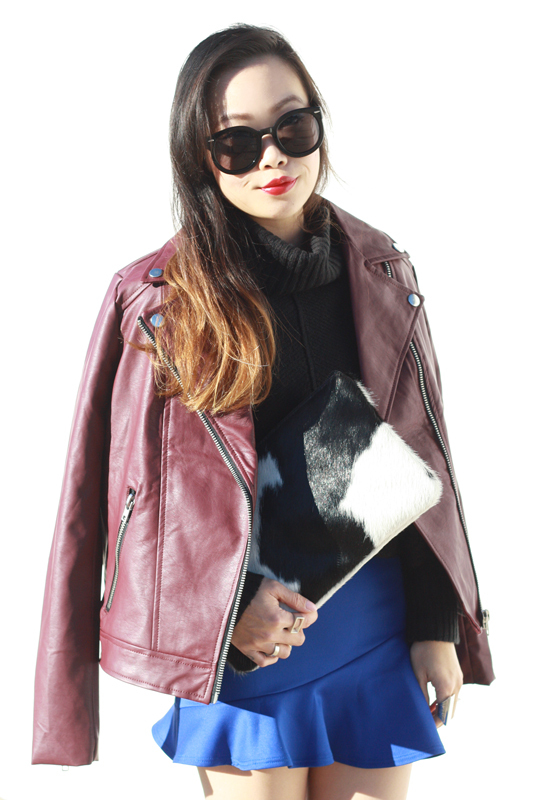 Burgundy leather jacket c/o F21. Black turtleneck sweater from Target. Royal blue flounce skirt from GoJane. Strappy heeled booties c/o F21.